Gwen Malone started volunteering at the Seattle House in 2004, and for the next ten years, her main job was keeping the medical supply cabinets stocked and organized. 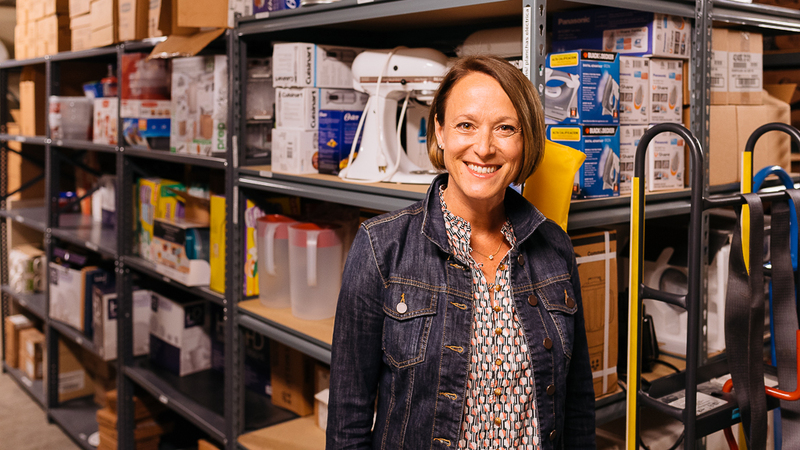 But it wasn’t until 2014 — a decade after she started volunteering — that she was given her biggest task yet: organizing the main basement storage room and taking inventory of what was inside. “The big clean and sort” — as Gwen calls it — was a daunting task. She tackled it once a week in four hour chunks. After three months, she had managed to get half of the room organized. She kept at it, every week, until one day she looked around and realized it was done. Today, everything has a place: on one shelf, a neat stack of extra lunch trays for the dining room; on another, rows of light bulbs, sorted by type. Gwen’s work has both increased the efficiency of the facilities team and allowed House staff to know what supplies are running low before they’re gone. Want to find out more about volunteer opportunities at the House? Head on over to our Volunteer page and check out our current open positions.